Henry Buckley, Jr. has signs agreement with Solar Entertainment. 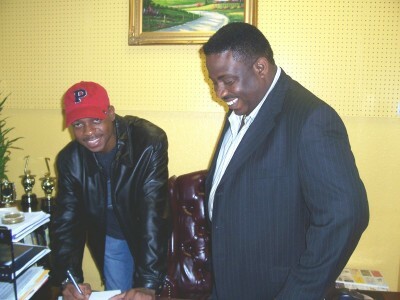 Singer/Songwriter/Producer Henry Buckley, Jr. aka Sadikihas signed a 1 yr. non-exclusive booking agreement with Solar Entertainment. Solar Entertainment President and CEO Delroy Carroll had this to say, “I saw Henry’s performance at the< New Jersey Reggae Festival. I feel that he has the potential to do great things in the business. We are excited about this signing.” The multi-talented musician, whose father was one of the founding members of The Paragons, has shared the stage with Shaggy, Sizzla, Beenie Man, K-Ci and JoJo among other artists. Carroll is wasting no time in showcasing the artist as Buckley is set to perform at the Solar Entertainment 10 Year Anniversary Show scheduled for December 3, 2005 at the Elite Ark in Brooklyn, NY. Other confirmed artists for the event include I-Wayne, Bascom X and Sasha. Sadiki’s New Album “MORNING’S COME” In Stores Soon!! !